A film-maker whose body was found buried in a shallow grave had been strangled, police have said. 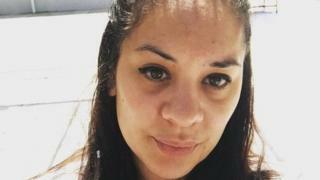 Laureline Garcia-Bertaux, 34, was found in her garden in Darell Road in Kew, west London, on Wednesday, after being reported missing on Tuesday. A post-mortem examination gave her cause of death as "consistent with compression of the neck", the Metropolitan Police said. A murder investigation is ongoing and there have been no arrests. Ms Garcia-Bertaux, a French national who had been living in the UK for many years, did not turn up for work at public relations firm Golin on Monday, and was reported missing the following day. Murder detectives said they wanted to hear from anyone who might have spoken to her between 2 March and Wednesday. "This may have been via phone calls, texts messages, WhatsApp or via any other social media platform," Det Ch Insp Simon Harding said. "Laureline was known to local people as she walked her two dogs each day." A forensic crime scene remains in place at the victim's home. Ms Garcia-Bertaux was last seen on Saturday 2 March at a supermarket in the Manor Circus area of Richmond. The Met had previously said her disappearance was "out of character". Originally from Aix-en-Provence, Ms Garcia-Bertaux had worked with Dame Joan Collins on the 2018 short film Gerry, with the actress saying she was "shocked by the horrifying news" of her death. Producer and actress friend Hester Ruoff described her as "an amazing individual" and said they had been due to start filming on a new movie next month.